Pluto-Bound Spacecraft Nears Its Quarry : The Two-Way After nearly a decade of traveling through space, NASA's New Horizons probe is about to arrive at Pluto. On Tuesday it will begin an intensive, weeklong study of the distant world. 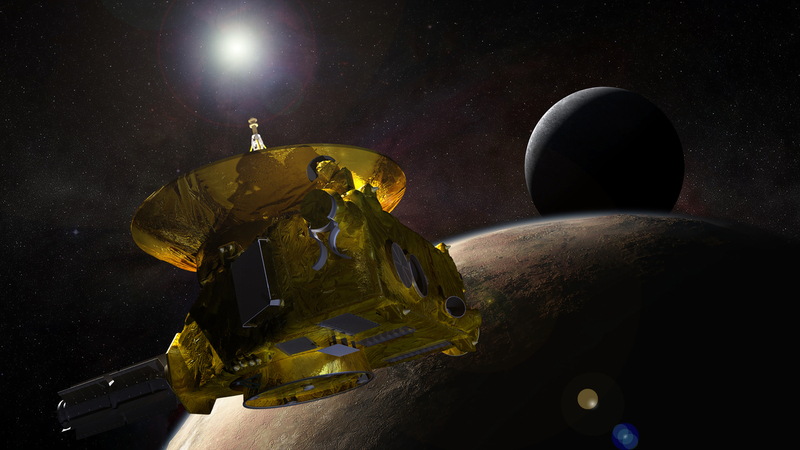 NASA's New Horizons mission will be the first ever to visit Pluto and its moons. This artist's conception shows the probe as it passes the dwarf planet. It has taken nearly a decade and 3 billion miles to get there, but scientists are about to get their first look at Pluto. The New Horizons spacecraft is closing fast on the tiny world once thought to be at the edge of our solar system. On Tuesday the probe will begin an intensive nine-day scientific study of Pluto and its moons. It has been a long time coming. New Horizons was launched in 2006. The spacecraft, roughly the size of a baby grand piano, rode atop a massive rocket that hurled it away from Earth faster than any spacecraft before it. Today it's so far away that it takes hours for its radio signal to reach Earth. 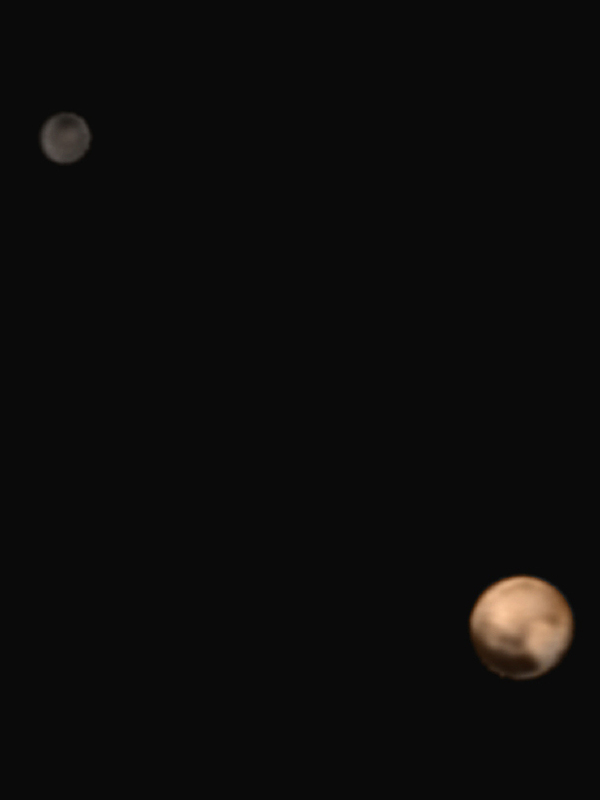 This image taken in late June shows Pluto (lower right) and Charon, its largest moon (upper left). New Horizons is set to pass closest to Pluto on July 14. "From Earth to Pluto, where our spacecraft is, is going to be about 4 1/2 hours," says Alice Bowman, the Mission Operations Manager of New Horizons. "So the information that we're receiving right now was sent 4 1/2 hours earlier." And it takes another 4 1/2 hours to send commands back. The people in mission control can't do things in real time. "No operator can sit on Earth and use a joystick to control where the spacecraft is looking or taking observations," Bowman says. "Pretty much you have to make a very smart spacecraft." New Horizons is going too fast to stop at Pluto. So it has just one chance to see the icy world as it whizzes by. Scientists like Bowman are doing everything they can to make sure the brief encounter goes smoothly. There's a lot at stake. The spacecraft is programmed to make over a thousand different scientific observations in the next nine days, according to Alan Stern, New Horizon's principal investigator. Stern says what planetary scientists know about Pluto right now could probably fit on a single sheet of paper. It's comparatively small, he says. "If you drove around its equator, it's about like clocking the distance from Manhattan all the way to Maui in Hawaii." It has five moons that we know of. The biggest one, Charon, is the size of Texas. But maybe the most important thing about Pluto is that we now know it is part of a vast outer region of our solar system called the Kuiper Belt. The belt "contains a very large number — probably billions — of comets," Stern says. "And it also contains thousands of little worldlets." Those worldlets are smaller than Pluto, but there are plenty of Pluto-sized planets, too. "There are more of them than there are gas giants and rocky planets," he says. This is a first look at a mysterious world in an unexplored part of our solar system, and Stern says there's never going to be another mission like it.